Thousands visit the Hocking Hills region each year. A playground for nature lover’s, the area is full of hiking trails, scenic vistas and even a cave or two. In addition to outside recreation like horseback riding, canoeing and rock climbing, you’ll find plenty to do in the small towns that comprise what is known as Hocking Hills. Step across the threshold of the Georgian Museum in Lancaster and step back in time to the mid-1800’s. The beautifully decorated home boasts 12-foot ceilings and a cantilevered spiral staircase the leads up three floors to the cupola which sheds light on the period furnished rooms below. Pack a picnic and take a self-guided covered bridges driving tour near the towns of McArthur and New Plymouth. Or take a train ride in historic Nelsonville and learn about the brick making and mining industry that once flourished in the area. Watch the Tecumseh outdoor drama near Chillicothe. In Logan you’ll find unique attractions like the world’s largest washing board and pencil sharpener museum. Tour the many antique stores in search of that perfect treasure from yesteryear, or walk the streets to view the historic homes and murals. You’ll also find thrills for the adventurous like zip lining, ATV trails, and go-karts. With so much to see and do in the area, you’ll want to stay a minimum of a few days. 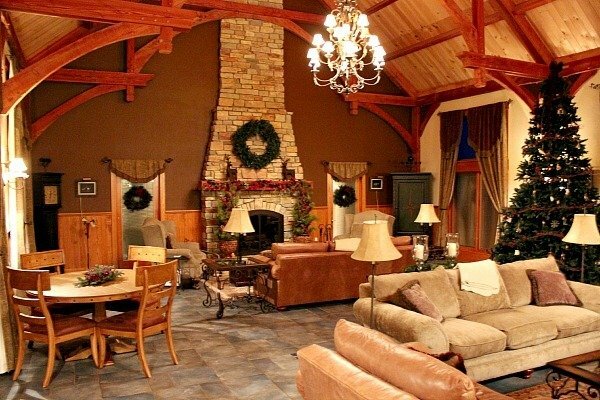 And you’ll find lodging choices to include intimate cabins to family resorts, with Hocking Hills luxury rentals that accommodate any size group, from two to 22 and more. 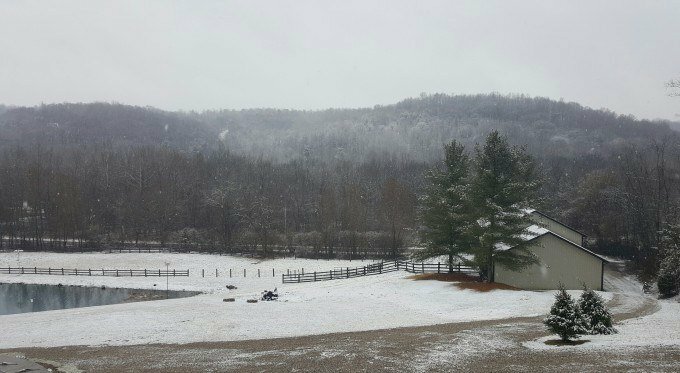 My husband and I were recently enjoyed a two-night getaway at Rush Resort near Laurelville. This beautiful cabin style lodge is minutes from Conkle’s Hollow gorge and Cedar Falls, two attractions you definitely want to add to your list when visiting the area. The 20+ acre private property features floor to ceiling windows and a large deck that overlooks the lake located on the grounds. The resort has seven bedrooms (eight, if you count the loft room) six bathrooms, a six-tiered movie theater with a movie theater popcorn popper, a game room with pool table, poker table and foosball table. And don’t let me forget the massage chair that held my husband captive for quite some time. 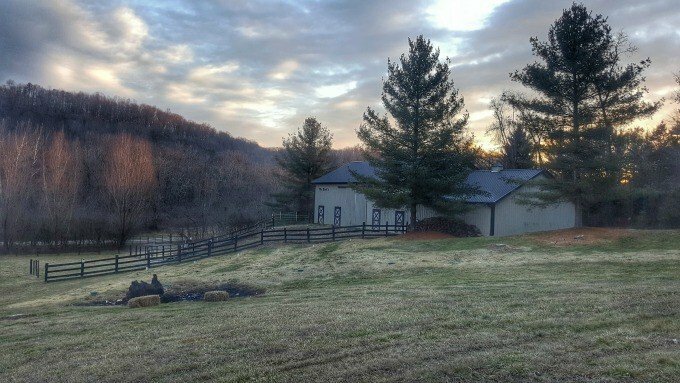 Outdoors, you’ll find a barn with stables for 12 horses (you’re welcome to bring yours and enjoy access to 40 miles of bridle trails), a heated swimming pool steps from the front door with plenty of seating, two grills, a fire pit and deck is lined with chairs to allow you to sit and enjoy the sunrise or sunset. Did I mention the eight-person hot tub? Yeah, there’s that too. I was instantly impressed by this property. The rooms are beautiful and well laid out to allow for privacy. Some feature bunk beds making them ideal for families who are vacationing together. The master suite even features a King size bed with two sets of bunkbeds, a large ensuite bathroom with both a Jacuzzi tub and large two-person shower, and laundry room. 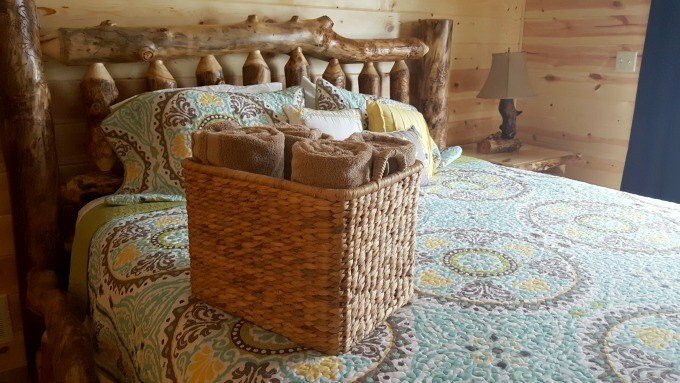 This cabin is stocked with everything you need for a relaxing getaway. You’ll find a fully stocked kitchen so you can cook your favorite meals, all linens and towels provided, and dozens of DVD’s to watch in the movie room. 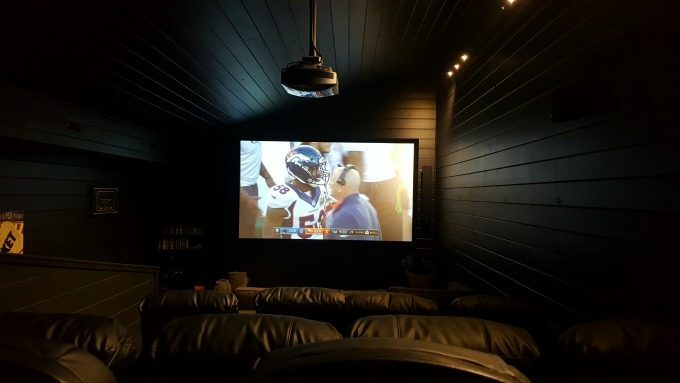 Our stay coincided with Super Bowl Sunday and my husband would probably tell you that watching the game on the 122” movie theater screen with the Paradigm Surround System while reclining in the large leather theater seats was close to heavenly. I on the other hand was happy to cozy up in a corner of the great room with a book and cup of coffee and prop up my feet in front of the gas fireplace, and NOT hear the Super Bowl. 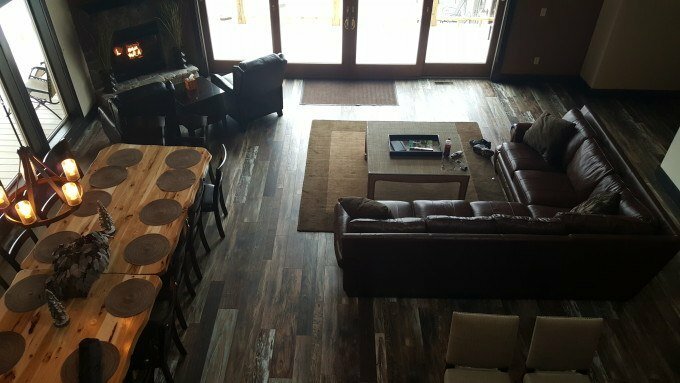 From the game room, to the pool, to the movie theater, my husband and I couldn’t help but think of our grown kids and how much they would enjoy a future stay at this beautiful, comfortable, and luxurious cabin. The stocked gourmet kitchen with stainless steel appliances made food preparation a cinch. The layout- with three levels, you have plenty of room to spread out, if needed. The lodge and surrounding area is quiet and peaceful. The bedding. I loved the bedding in each and every room. Did you see the vibrant orange bedding in the loft? Gorgeous. The resort is comfortable and luxurious. The movie theater is pretty awesome and there are even throw blankets for you to really cuddle into. How amazing is that? The property has Wi-Fi! Ideally, one would visit the Rush Resort to unplug, but I was on a “working vacation”- Wi-Fi was definitely appreciated. The grounds. With bridle trails, a fire pit, corn hole game and hiking trials nearby, what more could you ask for? I could go on, but I really must stop somewhere. Okay, this is pretty nitpicky because I really did love all of it. The three levels. Yes, I mentioned that I loved the layout, but I’m thinking of who I would possibly share the resort with on a return trip. Some of my family members would have a hard time with any stairs. However, once on the main level, you’ll find the great room, a bathroom, bedroom, kitchen and porch access where you can sit back and enjoy the view. During the winter, you may need 4-wheel drive to get up the driveway. Not a hindrance for us, as we do have 4-wheel drive and it definitely came in handy on our return trip home, but for some, this could pose a problem. See? I told you I was being nitpicky. The Rush Resort would be an amazing property for a girlfriend getaway, a small retreat, a family reunion and even an intimate wedding. 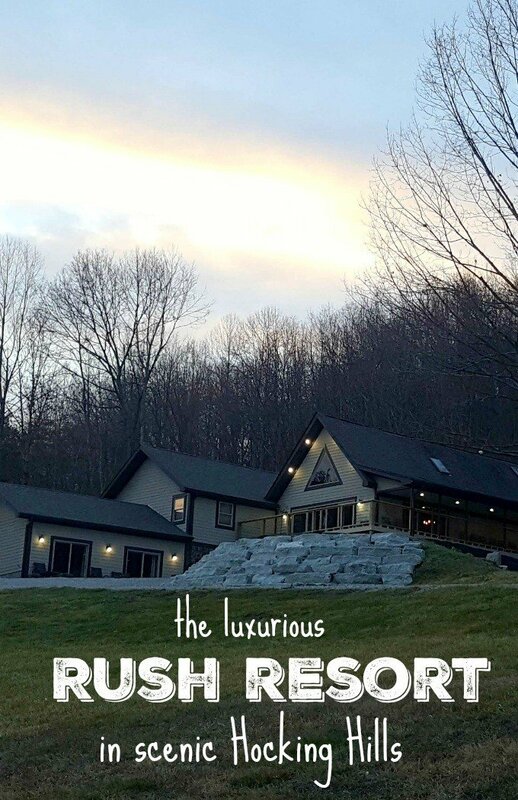 The Rush Resort is offered through www.OhioLuxuryLodging.com, offering beautiful luxury cabins in Hocking Hills and some of Ohio’s most luxurious vacation rentals. 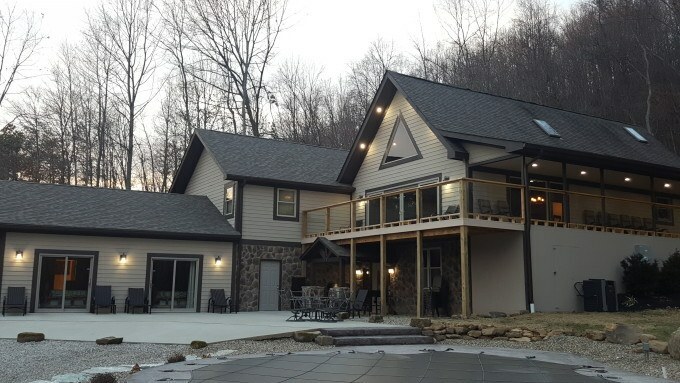 Visit the Rush Resort website to learn more about this luxurious Hocking Hills property. You may also be interested in the Laurel Run Farm, another Ohio Luxury Lodging Property. What do you look for when seeking luxurious lodging?